How can I see what I am doing when editing terrain in very deep shadows? 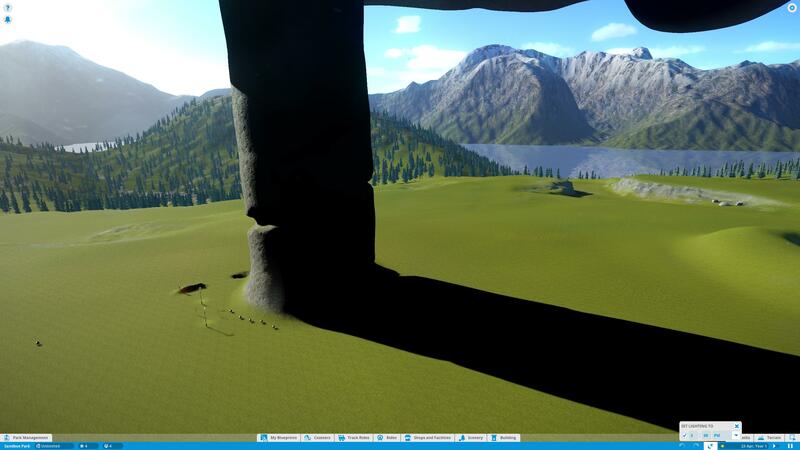 I'm testing what sort of things I can do with the terrain, but I ran into problems pretty fast. How do I increase general light level to see in the shadow side of large pillars or in tunnels? And no, none of the lights I can place give nearly enough light, I'd have to add hundreds of them just to see what I am doing when sculpting the terrain. Changing the time feels awfully clumsy way to do it and I can't get light in all the places that way anyway... Like into tunnels and under some large overhangs. Also It wouldn't work in places where sun can't shine. Naturally, the sun is casting the shadow and that is to be expected. The only other thing I can suggest is to work in a section, advance the time and so on. It's tedious, but I place working lights around when I really need to see what's going on. >Move or place more lights. Ok, so I guess I ran into a feature in the engine then. It appears that if the object is thick enough, is blocked from direct sunlight and from ambient light (which appears to come from directly above), the shadows are pitch black. Also there appears to be some light bleeding through the solid rock in some places, which shouldn't be happening. Of course the whole situation is a bit unrealistic, but I still I can't possibly light this huge cavern with the lights I can place. All I want is some work lights I could turn on and off (behind the camera maybe?). I don't want the lights there when I'm done with building. I guess I need to ask some dev about this. that would be nice...like a mining helmet mode. I know this may be a band-aid but you can always turn off shadows. It doesn't help with tunnels or underground work but it definitely would help with your picture example. But HMM! It seems that the top part there is what creates the extreme darkness, the light goes to the cave mode if there is overhead terrain. The pillar alone without the top part seems like it could be workable even in the shadow. Wow! I see what you mean! That's really interesting! That also has me wondering if there's another setting that would completely remove shadows that I just don't know about (I haven't had to mess around with graphics settings all that much). If you mess around with the graphics more and find a setting that completely removes the shadow from the pillar and the "mushroom" top entirely, please let me know!